Three friends come to visit, supposedly to comfort him. But their accusations that Job must somehow have brought these calamities upon himself spark a debate. As the four men dispute, in public, the nature of Job’s suffering they delve into ancient questions about the nature of man’s relationship to the Almighty, questions that can only be resolved by the Almight himself. Experience the power, passion, and poetry of one of the Bible’s most extraordinary stories as never before in this full cast presentation, which is anchored by a remarkable performance from Gerard Moses, who brings depth and dimension to Job, a good man struggling to keep his faith in the face of unbearable calamity. 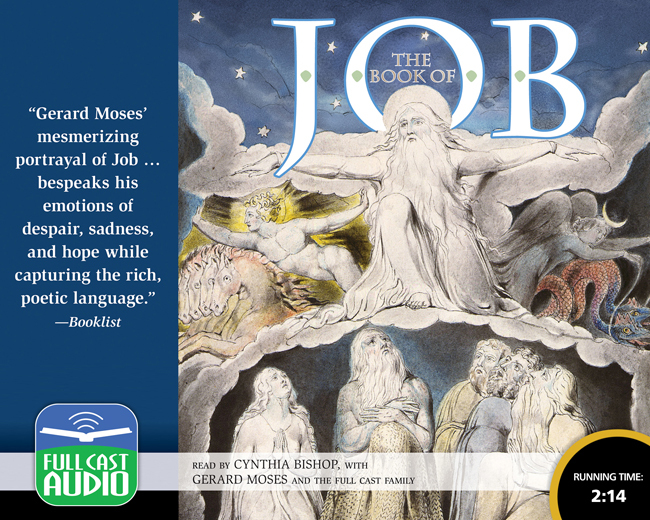 This is a recording to listen to over and over, for each new hearing will give you additional insight into the mysteries and wonders of this sacred text.